On November 15, 1974 Bob Stupak was approved for a gaming license for the Sinabar. Stupak was warned to keep better financial records in the future and the license was granted on a probationary status for one year. In the prior month he was questioned extensively about his business dealings in Australia. Board members warned Stupak he may face some troubles in that foreign country. The board deferred action on Stupak's request to relocate his Million Dollar Gambling Museum from a Las Vegas Boulevard location gutted by fire last summer (1973) to downtown Las Vegas. 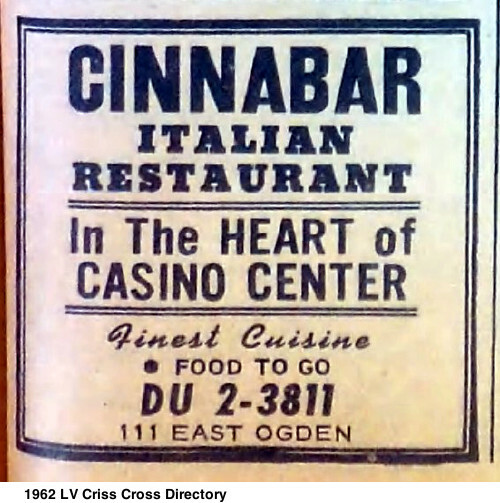 in the 1962 Criss Cross directory.